I like deduction games and I especially like games where you try and track down a criminal while he attempts to hide in plain sight. Unfortunately, most of the time this seems to result in a variant of Scotland Yard, which while I enjoyed it when I played it the first time, has come to be played out by now (and yes, I do mean you Fury of Dracula, Letters from Whitechapel and others of that ilk). For the longest time I’ve been looking for something that would scratch that itch but was unable to find it. In Mr. Jack Pocket (Hurrican) by Bruno Cathala and Ludovic Maublanc, the players take one of two teams: the first team is made up of Sherlock Holmes, Dr Watson and their dog (very much underplayed in the books, I assure you) while the other team is Mr. Jack all by himself, unless you count the innocents that he uses to hide in plain sight. Using a series of tokens showing 4 of 8 possible actions, they will in turn move the detectives, rotate or move the streets in order to try and catch Mr. Jack in the act. Should they fail to capture him after 6 turns, Mr. Jack will get away and win the game. The game comes in a very small box in which you will find a nice, thick multi-lingual rulebook (the rules are actually not that long, but 6 different language will make it thick); a set of 9 double-sided street tiles, each with an empty intersection on one side and a suspect on that intersection on the other; 9 suspect tiles, with either 0, 1 or 2 hourglass printed in the lower left corner; 3 detective discs, one for each of Holmes, Watson and the dog; 4 double-sided action discs; and 8 timer discs. Mr. Jack Pocket: a street tile, with a suspect showing. All tiles are the same, with three sides showing streets and one being closed off. The artwork on the tiles and discs is very nice and clear, with the thickness of the suspect tiles and the street tiles of a very nice thickness. The same cannot be said for the action and the detective discs, which are a little on the thin side. Since they are the pieces which you’ll be handling the most, this is a little unfortunate. The rulebook is well written, with the rules organized in a logical manner. We didn’t have a problem finding a specific rule the very few times we had a question during play. During the game, the players will take turns moving the detectives around the outside of the playing surface so they can see/can’t see the suspects down the streets until either one suspect remains (the Detectives win) or six turns pass without Mr. Jack being caught. To set up, first chose who will take the role of the detective and who will take the role of Mr. Jack. Shuffle all the street tiles, with suspects facing down and deal them out in a 3 by 3 grid. Flip all the tiles face up. 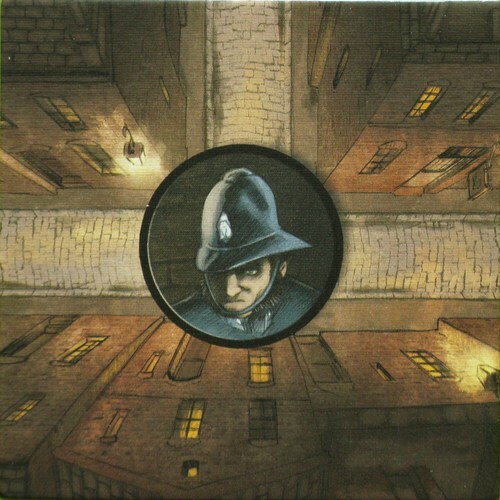 From the perspective of the Detectives, place the three detective discs on the outside of the grid thus: top left side for Holmes, top right side for Watson and bottom middle for the dog. There should be exactly 3 empty street tile sides between each of the detective. The Mr. Jack player then shuffles and draw the top suspect tile and looks at it in secret. This will be his identity for the game. Place all 8 time discs face up (the side with the magnifying glass or the knife), in numerical order, beside the board. These will indicate what turn it is and who starts the turn. Take the four action discs and do a “coin toss” with them (ie, randomly chose a side). This will be the first four starting actions. And we are ready to start, with the Detectives taking the first turn. The three detectives then, in turn look down the streets and note what suspects they can see. Once all the suspects that can be seen have been declared, Mr. Jack announces whether or not he can be seen. If only one suspect remains, the Detectives have caught Mr. Jack. They win! If more than one suspect remain, then Mr. Jack isn’t caught. He takes the current turn disc and turns it over to the hourglass side. If he has more than 6 hourglasses (including any additional suspect tiles he might have picked up), he wins the game. 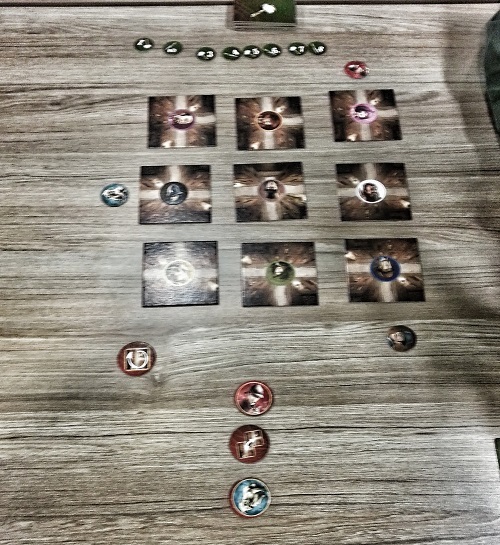 If no one won the game and it is Mr. Jack’s turn to start the turn (even turn), flip the action discs to the other side and Mr. Jack is now the first player. If no one won the game and it’s the Detectives’ turn to start the turn (odd turn), “coin toss” the action discs and the Detectives is now the first player. 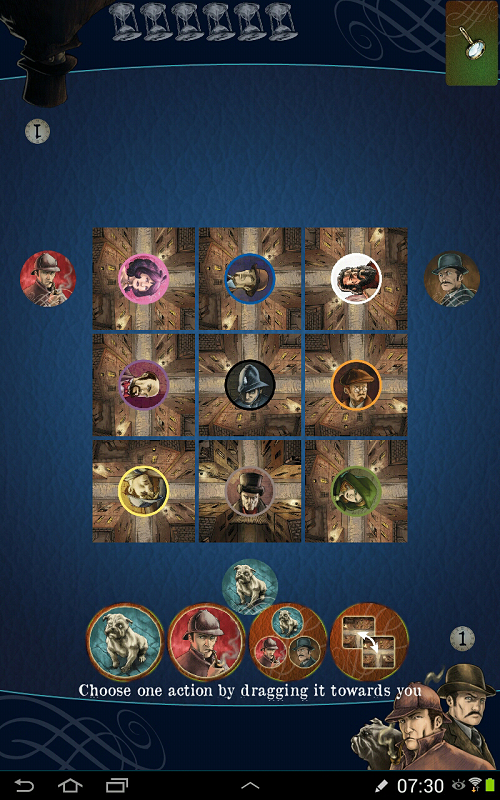 Should both players win at the same time, the Detectives now have to catch Mr. Jack (see him) before the eight turn. If they fail to do so, he gets away. Either Holmes/Watson/the dog: move the corresponding detective either one or two street tile side clockwise. The detective has to move, he cannot stay put if this action is chosen. All three detectives: if chosen by Mr. Jack, either move any 1 detective one street tile side clockwise or simply discard, doing nothing. If chosen by the Detective, move any 1 detective 1 street tile side clockwise. Rotate: there are two rotate action discs. Choose one street tile and re-orient it however you see fit, keeping it on the same side. Take a suspect card: when this discs is taken, take the top card from the suspect pile. If you are the Detectives, reveal it. If the suspect is still showing in the grid, flip it over to its empty side. If you are Mr. Jack, look at it, noting how many hourglasses are on the card and keep it hidden. If at the end of any turn there is more than one suspect in the grid and you have more than 6 hourglasses, including those on all suspect cards (except for the initial suspect card), you’ve won the game. The detectives will be moving from one street tile side to another. If there is a street on that side of the street tile, the detective can see to the intersection, and beyond if the street coming off the intersection keeps on going in the same direction. In this way, a detective can potentially see up to three suspect. Once all 4 actions are done for the turn, the players will check how many suspects the detectives can see in that way. I like this game, but with a number of caveat. While it does have a veneer of deduction, it is more of a game of “divide and conquer”, since the main mechanic use to try and discover the killer is by (hopefully) dividing the remaining suspects into two groups: the seen and the unseen. The closer to being the same size the better for the detectives. Should the groups be too unequal, it will prove to be to Mr. Jack’s advantage in all but a few situations. There is never really a need to actually figure out who is Mr. Jack, since simply reducing the original 9 characters to only 2 on the map, one seen and the other unseen, will do the job nicely. So, no deduction, except in the back story. 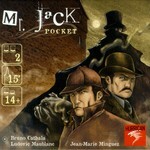 Mr. Jack Pocket: the physical game. Rather what you have is a game of careful planning and of maximizing the current available orders. Choose carefully and the opponent will not be able to do much to stop you on their turn. Make a mistake and your opponent should be able to really screw you over. The hardest turns are those where you are the first player, trying to figure out what action you want to take away from your opponent and that will do the most damage and that only comes with experience, no matter how clear the rules are to you. And in there lies the rub: inexperience will always cost you dearly. Play against someone who might only have a few games on you and it will be close to impossible to win. This might not really be a problem with the rule set, but rather more a question of being able to plan and see what is possible to do with the current set of action tokens. Of course, this also leads to some of the worst cases of analysis paralysis this side of Ricochet Robot. Before taking an order token, you want to calculate every possible permutation with every token that is left in order to make sure that you will come out ahead. While this is fun in and of itself, it is not deduction. A note on the Android version: while it is very true to the physical version, I’m just a little sad that there are no pass-and-play or online play included in the game. The only way you can play is against a fairly good AI, which comes in three levels of difficulty. The only competitive aspect of the game is a leaderboard, which tracks how many games in a row you’ve won. A little bit of a lost opportunity, especially when considering the higher than average price. This entry was posted in Review and tagged Mr Jack Pocket on October 23, 2013 by TopDog. – First you are now able to change your mind after selecting an action. You can simply drag the selected action away from your side to be able to select another action. – Then Achievements appear in Mr Jack Pocket to follow your progress in the game and compare it with your friends. – And finally game rules are now available in a complete PDF version so you can masterize it before challenging the AI. Mr Jack Pocket is now available oniOS devices and the Android version has just been updated to provide 2 players mode on the same device (with an innovative feature to identify Jack when you’re playing him). A new character: James Maybrick is also part of this update and provide new challenges.